Stbl2 E coli from Invitrogen Grow at 30 degrees in 2xYT media (see comments section below for more information). Please use 20 ug/ml of Amp. 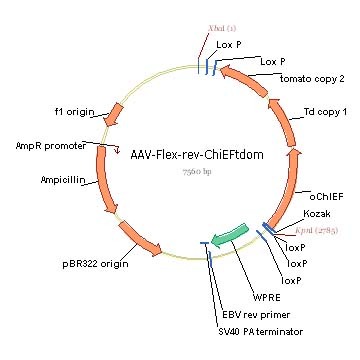 Please note this plasmid has a I170V in channelopsin 1. The changed amino acid improves the protein’s function. 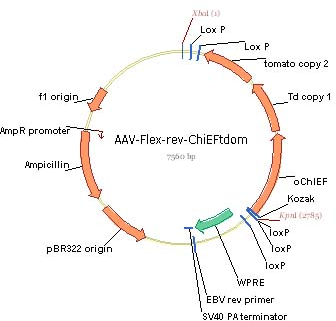 To minimize recombination, propagate this plasmids in Stbl2 cells from Invitrogen. 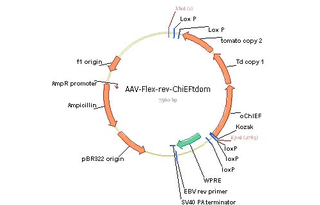 Also, to minimize recombination, cells should be cultured at 30 C.
For more information on growth conditions, please see www.addgene.org/18917 as this is the backbone vector. Because recombination may still happen occasionally, we do a panel of restriction digestions to assess whether the ITRs are in tact. Separate digestions with PvuII, Sma1, and SnaB1 should be performed. The expected patterns can be calculated from the attached sequence. Please see Reviews in the right column for an image of Addgene's digest with these enzymes.